FP-GPIO96 is a general purpose I/O FeaturePak module using a high-capacity (700K gate equivalent) PCI Express FPGA for maximum density and flexibility. The base hardware configuration features 96 digital I/O lines grouped into 12 8-bit ports. 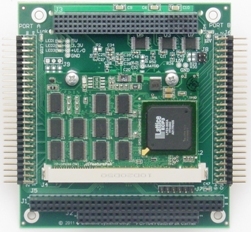 All ports have I/O buffers to protect the FPGA and feature 5V logic drive levels. The ports are organized into a combination of byte-wide, nibble-wide, and bit-wide direction control for maximum flexibility and application compatibility. The built-in FPGA personality provides multiple configuration options. All 96 I/O lines may be used in common I/O mode; Six of these ports can be reconfigured to enable an array of additional features, including 8 32-bit up/down counter/timers with programmable input source and gate, 4 24-bit PWM circuits with 0-100% duty cycle capability and interrupt/latched mode operation. The flash-based design enables easy field upgrades using a Diamond-provided software utility (no cable or third-party software required!) as well as custom code development. Universal Driver software support (described below) is included for Linux, Windows XP, Windows Embedded CE/Standard. 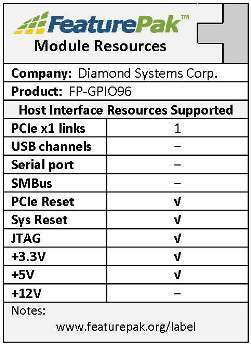 Diamond's exclusive Universal Driver Software is included at no charge along with the FP-GPIO96 I/O module. 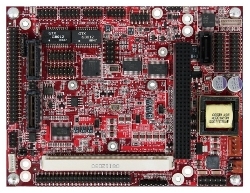 It provides a high-level programming library for all of our I/O boards, as well as for the data acquisition circuitry on our SBCs and Embedded-Ready Subsystems. All data acquisition features are supported by easy-to-use function calls, resulting in a reduced learning curve and shortened application development time. The Universal Driver works with Linux and Windows XP. Application examples and projects are included for each function, each board, and each operating system, in order to provide a quick starting point for learning and development. Learn more about our Universal Driver software here.